Why do I need to unroll my silage/ hay bales ? Tests have been conducted using the latest high density round bales and it has been found that the bales typically weighing up-to 750kg are difficult for animals to pull apart and eat, this means that animals wintered inside struggle to put on weight and maintain condition. 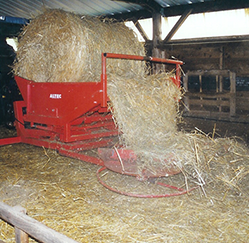 A simple test was conducted using clamp silage and wrapped round bales, if the round bales are unwound so the stock can get to the food easily then the condition of the animal is maintained, when the bale is just dropped into a round bale feeder or into the passage way then the animals struggle to pull the bale apart and eat. 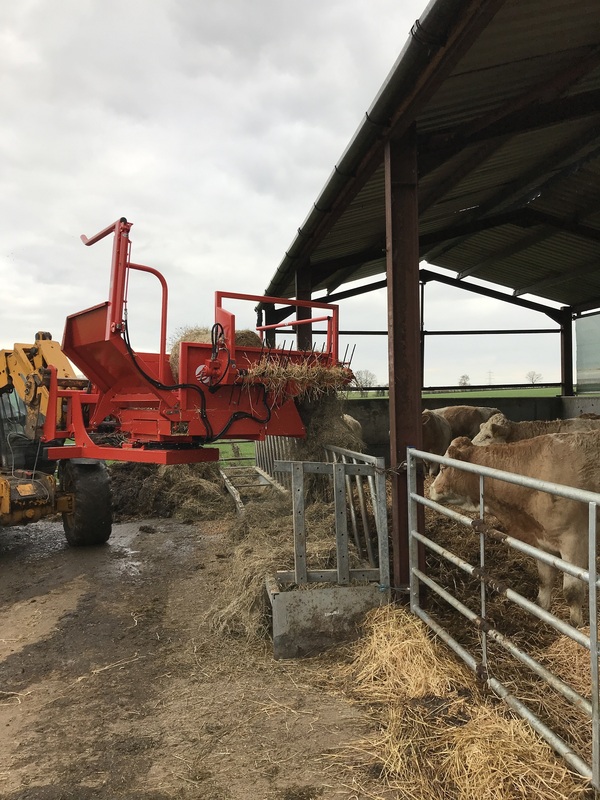 The amount of waste of feed that had not been eaten was also monitored and it was found that feeding out a ration with a bale unwinder also cut down on wasted feed, either not been eaten or pulled and trampled. 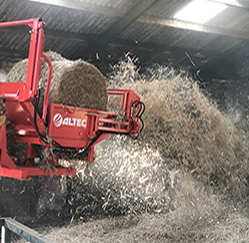 This proved that if using a round bale un roller you can minimise waste and improve animal health ,this is comparable to using clamp silage as a ration. 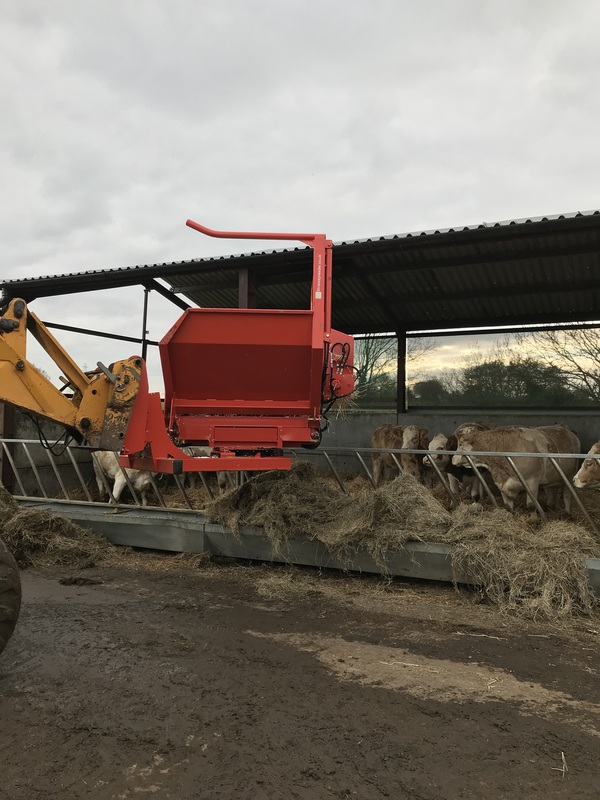 It was also noted that as you are putting out a ration with a bale unroller, you can spread out the feed to allow all animals to eat and monitor the amount of feed been given to ensure that sufficient is been given for the head count you are supporting. 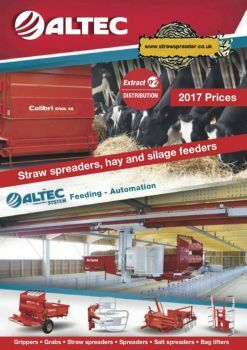 The bale unroller has also been tested in conjunction with a diet feeder, classically diet feeders, although a great way to mix different types of feed, can be costly and slow to run, if you unwind the bale into the mixer, it cuts down of the time taken to mix and minimises the fuel used to mix the rations. 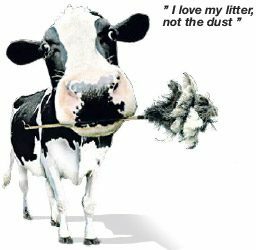 You can add silage or straw using this method. 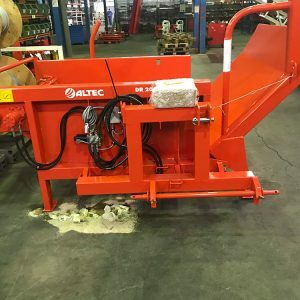 This group of machines can be specified to whatever your requirements are, the most basic machine is three-point linkage mounted and is fixed one way, usually to the right. 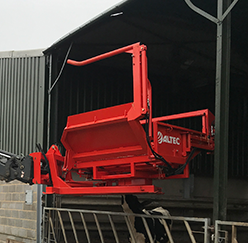 The machine can be up-graded to have telehandler brackets and pressure limiter fitted, with this option you can still use the three-point linkage if required. Please see the brochure for model options or contact us, i am sure we will have a model to suit your requirements.